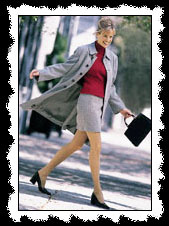 In business since 1979, Blue Heaven Hosiery is a leading distributor of mens, womens and childrens hosiery. Our line includes high quality legwear for all occasions. --- From luxurious sheers to sophisticated tights. --- From contemporary pantyhose to basic sport socks. --- Our unique collection suits all your hosiery needs. Here at Blue Heaven Hosiery, our vision is to create hosiery for all dressing and lifestyle occasions. We pride ourselves in being synonymous with quality, class and fashion. We do all what it takes to deliver exceptional style, service and value to our customers. And therefore, to create quality-perfect garments, we make sure all of our products are made with the finest yarns. Evenmore, many of our pantyhose and tights are fabricated with the original Lycra® from Dupont to give the garment the support and fit we feel it truly needs. In addition, our innovative range of styles run in various sizes and in a broad spectrum of colors to suit each ones taste and preference. And to it all, we continuously develop new styles and update our colors to provide our customers with more selection and with the latest in fashion. Moreover, as you will browse through our product line, you will notice that all of our products are packed with attractive packaging to match the quality garment thats enclosed in it, and to look the most appealing when displayed. Tailored to individual needs, we fulfill the request of our customers, who demand quality at affordable prices. And therefore, by means of the various brands we carry, we cover all market segments, including wholesalers, chain stores, and retailers. Should a customer request it, we do private label too! Blue Heaven Hosiery has won overwhelming acceptance on the retail front since we offer: supreme quality, best prices, and overall, we stand behind our products! Thank you for your interest in Blue Heaven Hosiery and we hope you enjoy your on-line experience with us!